, is a Zen-existential love song that ponders enduring fidelity through numerous rebirths; in Epsteins hands, its whimsical, whip-smart, and pull-quotable. The bands performances, too, are instantly approachable and engaging, and theyve made The Motion Sick one of collegiate Beantowns most popular acts. Her Brilliant Fifteen, their self-released debut, was named one of the best local albums of 2006 by Boston Metro. Later that year, The Motion Sick won a citywide talent search hosted by WFNX and the New England Institute Of Art; as the Last Band Standing, they secured a recording contract with Naked Ear and airtime on the popular alternative station. They even played against type  to a wildly enthusiastic reception  by impersonating Poison during a Halloween gig at TT the Bears. But their fame has spread far beyond the Massachusetts capital: Her Brilliant Fifteen was featured in Spin, and the group was a finalist in the magazines Best Underground Band of the Year competition. Extensive regional touring has brought The Motion Sicks explosive stage show to venues around the Northeast and Midwest  theyve played the International Pop Overthrow in New York City, the Midwest Music Summit in Indianapolis, and many other events and festivals. This quartet is, clearly, a band on the move. promises to raise their profile even further. Here are nine immediate, melodic indie rock tracks; stylistic detours and genre experiments; hooky melodies; full, warm arrangements; and, as always, thought-provoking words. The Motion Sick have opened up their sound substantially, incorporating banjo, analog and digital synthesizer, brass, strings, and even some electronic programming into their songs. The album includes an alt-country number, an ominous art-rock song by Boston underground legend Sophia Cacciola (she lends her voice to the recording), and an inspired cover of Love Will Tear Us Apart. But the heart of the project remains the interplay between Epsteins winning vocals, Patrick Mussaris guitar, and the steady rhythm section of Matthew Girard and Travis Richter. The distinctive-looking (and stealth-charming) Epstein is the star of Neil Formans sweet clip for 30 Lives. The director takes the band back to high school, and shows the Motion Sick frontman pining away for a gorgeous classmate. We watch him staring at her in class, passing notes to her during lunch, and admiring her picture in his locker; his bandmates serve as a Grease-like crew, dancing alongside him, throwing dice in the boys room, and providing sympathy. By the time we reach the memorable video-game chant in the middle of the song, everybodys out on the football field, waving their arms and cheering along. No surprise, then, when a fully-choreographed sequence breaks out in the middle of the gridiron  with the boys of the Motion Sick leading the way.
. for all of your on-air giveaway needs, so drop us a line to get your hands on some! If you need more info, call Andy Gesner at 732-613-1779 or e-mail us at HIPVideo@aol.com. 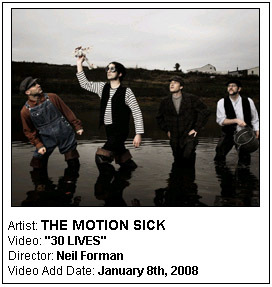 You can also visit www.TheMotionSick.com to find out more about The Motion Sick.